Ravindra Babu Dhanwa: Ravindra Babu Dhanwa, An Adivasi Peasant from Palghar, Maharashtra. The year 2017 saw an outpouring of farmers’ protests sweeping the country. To understand why they happened, NewsClick presents a series of profiles of farmers from different parts of India, based on interviews done by students from Delhi, guided by the Society for Social & Economic Research (SSER). See Introduction to series. Ravindra Babu, belonging to the Malhar Koli tribe, is from Ambhai village in Vada Tehsil of Palghar district, Maharashtra. At the time of the 2011 Census, about 119 households lived in Ambhai. Adivasis accounted for about 54 per cent of Ambhai’s population. As a result of the decade long agitation for land titles, thirteen households in Ambhai have been given pattas so far. Of these, nine households got pattas for about an acre of land each while the remaining for about 0.75 acres each. Palghar district, which was carved out of Thane district in 2014, has a long history of adivasi struggles. They make up about 63 per cent of the population of Palghar. About 55 per cent of the district is covered with forests. Adivasis in Palghar live under a persistent threat of their lands being grabbed by land sharks and continue to struggle for legal titles to the land that they possess and cultivate. Over the last 10 years, several large demonstrations and protests have been organised by the All India Kisan Sabha in Thane and Palghar districts to pressurise district administration to give land titles to adivasi peasants. In November 2015, about 8000 adivasi peasants from two talukas, Vikramgarh and Vada, came together for a large demonstration to fight for land titles. They sat on a dharna for six days, cooking meals from small quantities of grain contributed by adivasi families. The sit-in forced the district administration to start accepting applications for land titles under the Forest Rights Act, 2006 (FRA) and about 10 thousand applications were filed. This demonstration set an example for peasants all over Maharashtra to fight for their rights. Since only a few adivasis got the pattas for land, another massive agitation was launched in Nashik on October 3, 2016. Over 50000 adivasi peasants battled rain and blocked all roads for 16 hours, forcing the collector to agree to initiate the process of distribution of land pattas under the FRA. Although some pattas were given and applications accepted from many adivasis, the District Collector was transferred after six months and the new Collector stalled the process. Ravindra Babu Dhanwa lives in Ambhai with his wife, mother, two sons and one daughter. They possess 8 acres of forest land. Of this, they received patta for one acre about six years ago. Most of the land they possess is undulating and rock-strewn, and only about 1.5 acres is cultivable. The land is unirrigated and single-cropped. Paddy was sown on one acre of the cultivable land, and the rest was used for pulses, ragi and bajra. All the grain was used for their own consumption, and there was no surplus left to use as seed next year or to sell. They only sold about three quintals of paddy straw for Rs. 430. All cultivation was done using family labour but, since they did not have bullocks, they had to hire a tractor to get the land ploughed. The family cannot make their ends meet with production on this small amount of land, Ravindra Babu, his wife and eldest son do wage labour on most of the days. They work as agricultural labourers or do earth work, whatever is available. In Ambhai, the wages for male workers are Rs. 150 per day while women are paid only Rs. 125. Last year, Ravindra Babu and his son found wage employment for about 100 days in a year while his wife managed to get work for only about 50 days. Ravindra Babu’s wife also did all the housework and had to regularly spend time collecting firewood from the forest. It is important to note that, although land possessed by this household does not provide them adequate income, it is crucial for their food security. They produced not only 12 quintals of paddy for self-consumption, but also a little bit of urad, tur, ragi and bajra. 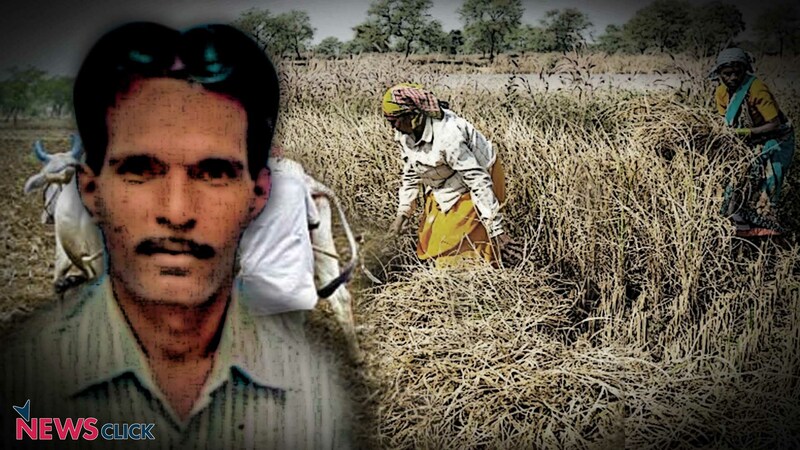 Adivasis like Ravindra Babu have been part of a series of agitations in Palghar to protect their land, and in turn, to protect their livelihoods and food security. This is the struggle that brought him all the way to Delhi to participate in the Kisan Mukti Sansad in November 2017. Prachi Bansal is a Research Scholar at Jawaharlal Nehru University. Part 1 of the series can be read here. Part 2 of the series can be read here.